UN Human Rights group to investigate possible abuse in Timor-Leste Diario Nacional 5 February 2010 The Special Representative of the UN Secretary General, Ameerah Haq has said the United Nations Integrated Mission in Timor-Leste’s (UNMIT) special human rights and justice unit will make a report and investigate some recent possible cases of human rights abuse. National Police powerless to help residents calling for assistance Timor Post 5 February 2010 The Timorese Operational Police Commander, Inspector Mateus Fernandes, has said that the police were saddened to hear of the desperation expressed by local residents, asking for help to stop violence in the capital Dili. Police Commander to remove two Kovalima district police officers Timor Post 5 February 2010 Timorese Police Commander, Commissary Longuinhos Monteiro said two Timorese National Police (PNTL) officers of Kovalima district will be removed following recent allegations that they were involved in recent ninja gang movements in Kovalima. Local residents urge security post to be set up Radio Televisaun Timor Leste 5 February 2010 Local residents, Faulara suburb in Dili have urged the Timorese Government to set up security post, because the UN Police is incapable of responding to the recent disturbance which engaged the mart art clubs and the young gangs. State Secretary of Security doesn’t pay attention to police: NGO Radio Televisaun Timor Leste 3 February 2010 The Director for the National NGO “Labeh” Christopher Henry Samson said the State Secretary of Security is not paying enough attention to local police officers currently conducting operations in the Bobonaro and Kovalima districts. National Police to extend operations in Bobonaro and Kovalima for another six months Radio Televisaun Timor Leste 4 February 2010 The Timorese National Police (PNTL) have decided to extend their operations in Bobonaro and Kovalima districts for another six months. Task Force police to be reinstated: Police commander Radio Televisaun Timor Leste 4 February 2010 The Timorese National Police (PNTL) Commander, Commissary Longuinhos Monteiro has said that the National Police Task Force will be reinstated to respond to the recent violence in the country’s capital Dili. Police violated human rights: Legal advisor for resistance organization Radio Televisaun Timor Leste 4 February 2010 The legal advisor for the resistance organization “CPD-RDTL” has strongly criticized the Timorese National Police (PNTL), following a number of recent arrests of the resistance organization’s members without an arrest warrant. Commissary Monteiro hits back at parliamentary criticism Timor Post 4 February 2010 The Timorese Police Commander, Commissary Longuinhos Monteiro has called for the criticism to stop over his involvement in a recent police operation hunting ninja gangs in the Suai of Kovalima and Bobonaro districts. Timorese Army to join with Timorese National Police to combat ninja gangs Timor Post 4 February 2010 The Timorese Police Commander, Commissary Longuinhos Monteiro has announced that he will enlist the assistance of the Timorese Defense Force (F-FDTL) in a joint operation to combat the rise of martial arts gangs in the Bobonaro and Kovalima districts. Commissary Monteiro: “We should not depend on the UN Police to maintain security” Timor Post 4 February 2010 Timorese Police Commander, Commissary Longuinhos Monteiro has said that although the United Nations Police is still responsible for maintaining security in some districts, the country needs to begin looking towards its own national police force for security in the future. MPs shouldn’t comment on my work: Police Chief Monteiro Suara Timor Loro Sa’e 4 February 2010 The Timorese National Police (PNTL) Commander, Commissary Longuinhos Monteiro has called on the parliamentary members not to question his presence in recent operations hunting down ninja gangs in the Bobonaro and Kovalima districts. PNTL to announce 250 new police recruits Timor Post 4 February 2010 The Timorese Police Commander, Commissary Longuinhos Monteiro says he is going to employ 250 new police officers to boost a lack of numbers in the current force. Parliamentary Committee B criticizes United Nations Police Timor Post 4 February 2010 Parliamentary Committee B for Defense and Security President, Duarte Nunes urged the United Nations Police to inform the Parliament if they are incapable of controlling the situation in the capital of Dili. President Horta: “PNTL should learn as much as possible from the UN Police, while they remain in Timor-Leste” Diario Nacional 1 February 2010 President Jose Ramos Horta has called for the Timorese National Police (PNTL) to work more effectively with the United Nations Police while the UN remains in East Timor. MP Bisoi: “National Police officers involved in recent fatal martial arts street clash” Diario Nacional 1 February 2010 Maria “Bisoi” da Câmara from the National Congress for the Timorese Reconstruction (CNRT) has revealed that some of the Timorese National Police (PNTL) officers were involved in a recent martial arts clash, which left a young man dead. Horta supports police to prohibit resistance organization from raising flag Timor Post 1 February 2010 President Jose Ramos Horta said he agreed with the Timorese National Police Commander (PNTL), Longinhos Monteiro’s policy of prohibiting the CPD-RDTL [a Timorese Resistance Organization] from raising their flag within the community. District Police Commander concerned about dismissal of PNTL officers in Lautem Timor Post 1 February 2010 Lautem District Police Commander, Olavio Cristovão said he was concerned about the decision to sack two of his police officers by the Timorese National Police (PNTL) general commander. Lasama calls for National Police to lower the Illegal organization’s flag in Suai Suara Timor Loro Sa’e 2 February 2010 The Parliamentary President Fernando “Lasama” de Araujo has called for the Timorese National Police (PNTL) in Suai, in the Kovalima and Bobonaro Districts, to lower flags for the ex Timorese resistance organization CPD-RDTL. 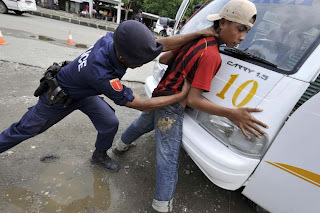 Timorese Army and Police to hunt Ninja gangs Suara Timor Loro Sa’e 2 February 2010 Timorese Defense Force (F-FDTL) Chief of State, Colonel Filomeno Paixão has threatened local martial arts/ninja gangs with Timorese Army intervention if they do not cease violent activities. Timorese Police Commander doubtful UN can ensure peace Suara Timor Loro Sa’e 2 February 2010 Timorese Police Commander, Commissary Longuinhos Monteiro has cast doubt on the United Nations ability to ensure peace in Timor-Leste.